In the glory days after he retired Martin Johnson told me he thought he had something to offer on the coaching side but was determined to gain some experience before putting himself forward for a top job - something like the forwards coach at a good club would be a good place to start he felt. How he must wish he had stuck to his guns and turned down the England job when they came knocking after the 2007 World Cup. But who could blame him? They came up with a new job title making him the 'manager' - a new concept in rugby. He had a full coaching team below him but he was the man in overall control. They also offered a shed load of money. It would have taken a strong man to turn it down. Nobody ever figured out exactly how much input he had into coaching. He was certainly not a presence on the training field and never appeared to be in charge but he was the apologist, the man wheeled out after successive disappointments to explain where England were at and where they were going. He was very definitely the chief selector, and that was perhaps his biggest failing. 'The players we brought in over the past 12-18 months have become first choice established,' he said yesterday. That is true but hardly revolutionary in terms of international rugby especially when you inherit an ageing squad. The reality is that he was far too conservative - the old guard was allowed to continue for far too long - and the youngsters he is now claiming credit for were held back. He was eventually forced to introduce new blood but by then it was too late. His stubborn streak was one of his strengths as a player but it turned into a weakness. Nobody expected him to follow the crowd but it took forever for him to realise that it was time Steve Borthwick was put out to pasture and that Shontayne Hape just did not have the X-factor when it was blindingly obvious to every other observer of English rugby. There was no chance that Borthwick would last through to the World Cup but he persevered with him as captain when he should have been grooming a new leadership team. "It's been a fantastic three and a half years - I've worked with some fantastic players and a great coach and management group,"2 was another quote from his resignation statement. It sounds like a tribute - the sort of thing you say when you have just won a World Cup or some other major triumph. Sorry Martin but that is just not true. The coaches produced a team that did not appear to have a cogent game plan or style and the players let you down badly on and off the field. That was perhaps the biggest disappointment for me - he would continue to say black was white whatever the evidence to the contrary. "I think we made huge strides," was another claim that is just not born out by the facts. England had reached the two previous World Cup finals; in New Zealand they went out in the quarter-finals to equal their worst ever performance. They won the Six Nations last season but fell dismally at the final hurdle when a Grand Slam beckoned - hardly a confidence booster going into the ultimate test. Over the same period Wales and Ireland both won Grand Slams despite having very limited playing numbers to choose from. The reality is that England should be challenging for honours every season. 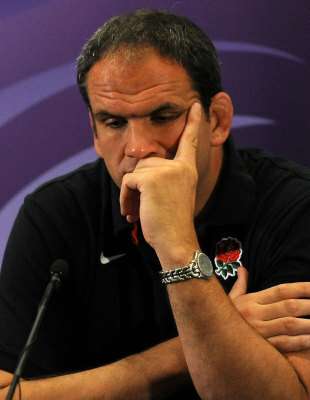 In world rugby only France can get close to England in terms of the pool of players available. Perhaps the biggest surprise and disappointment of the Johnson regime was the way he was let down by those players. He was renowned as an enforcer on the field but was far too soft off it. I can fully understand his start point - look, you are all grown men and I expect you to behave like professionals - but when they abused that trust he had to clamp down. Although we are now told he was 'furious' when Mike Tindall refused to apologise publicly after the Queenstown night of shame but we shall never know because his only response at the time was the ill-advised 'shock horror - rugby player drinks beer' type comment. The message that he gave out was that it was no big deal, a massive misjudgement. "The off-field stuff didn't help. It portrays the team in a bad light and not in an accurate light," he claimed yesterday, finally realising he had no option but to resign before he was removed so even now he is in denial. It was an absolutely accurate light! He was the knight on the white charger who led England to glory as a player but it was always too much to ask him to repeat the feat so soon as a coach/manager. He is now certainly older, wiser and very bruised. Perhaps it is time to go back to plan A.